The stability analysis of the steel frame described in my previous post can also be performed in RF‑/FE‑LTB according to the Equivalent Imperfection Method. The following post describes how to calculate or determine the critical load factor. The load application point is defined directly in Window 2.2 Member Loads. 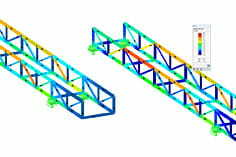 Due to the tapered beams, the mean value of the cross‑section height is used in the calculation. You can define the boundary conditions of the substructure in Window 1.4 of the RF‑/FE‑LTB add-on module (all seven degrees of freedom). Then, you can start the calculation. In this model, the critical load factor αcr of 2.379 results (see Figure). You can also display the mode shape graphically in Window 2.3 Imperfections window (click [Select Imperfections] button) for checking and evaluation purposes. It is recommended to change the representation of deformation results to ‘Cross‑Sections Colored’ in the Display Navigator and to adjust the display factor in the panel.